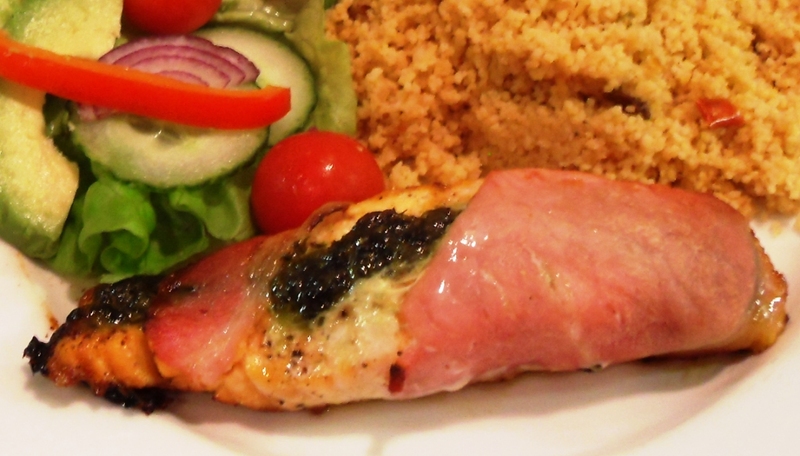 You are here: Home / Fish / Bacon-wrapped Salmon – quick & simple! 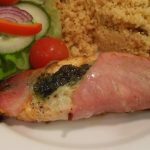 Bacon-wrapped Salmon – quick & simple! 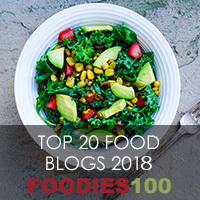 Having had it drummed into me during Home Economics lessons that you should eat at least 2 portions of fish a week and one should be oily, I do try to stick to this! Hence I normally cook Salmon or Trout once a week and was running out of new ways to serve it. 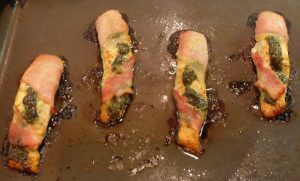 Then along came Nigel Slater’s Kitchen Diaries II to the rescue and the first recipe I made a beeline for was Bacon-wrapped Salmon. I am forever wrapping chicken in bacon with various stuffings and so this seemed a really logical thing to do. Well instead of moaning “not Salmon” the family eagerly wolfed down their dinner and so I am utterly thankful to Nigel for giving me a way to serve Salmon that doesn’t involve me being moaned at! 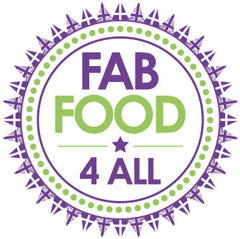 As Nigel always says, his recipes are a starting point and he expects people to use them as a platform from which to develop their own dish if they so wish. With this in mind I used what I had in the fridge and therefore this is my version of Nigel’s recipe! I found the coriander went really well as it has an almost lemony quality to it and the squeezy tubes I bought on offer have saved me a lot of money as I use so much coriander. They are also great for stirring through greek yogurt as a dressing! I am also entering this dish into Karen at Lavender and Lovage’s “Herbs on Saturday” challenge which is being hosted by Vanesther at Bangers and Mash this month. 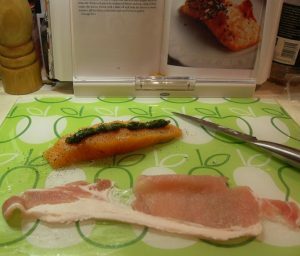 Stretch your bacon and then season salmon and squeeze on minced coriander. Carefully wrap the bacon around each salmon steak. 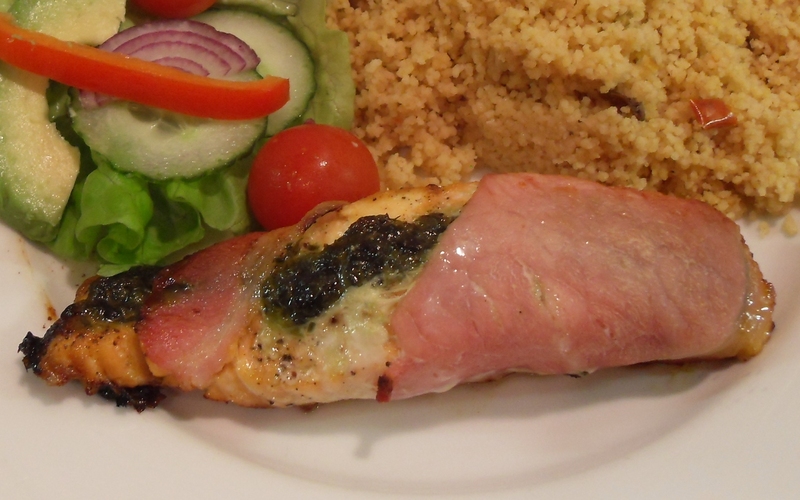 Baked salmon wrapped in bacon with coriander, super quick and super tasty! Stretch the bacon with the side of a knife. Season the salmon with pepper and a smidgeon of salt. Squeeze the minced coriander onto the salmon or lay on the fresh coriander. Wrap each steak in bacon carefully. Lay on a baking tray and drizzle each steak with oil. Bake for about 20 minutes or until the fish is cooked and the bacon golden. 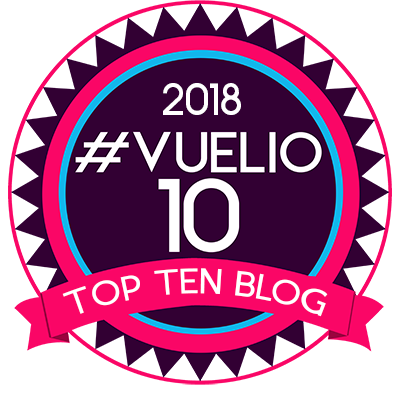 Previous Post: « Happy New Year and Thank You ….. 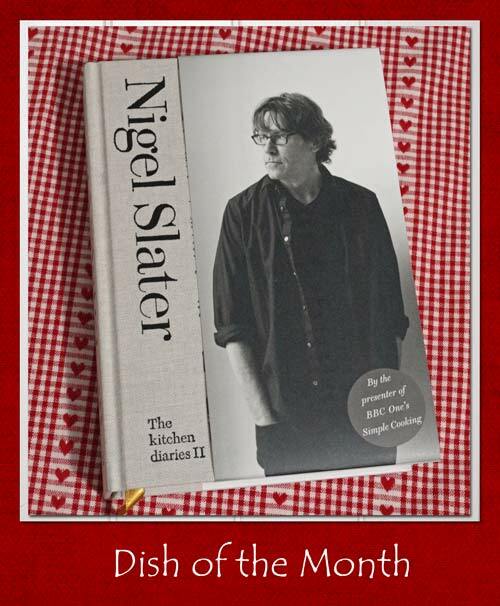 This is a fab idea and I love Nigel’s recipes 🙂 Thanks for showing this one though as I think this is one I would of been a bit nervous of doing but seeing it here it looks so easy I think I will have to give it a try ! Is there anything that bacon *doesn’t* improve? yum,. 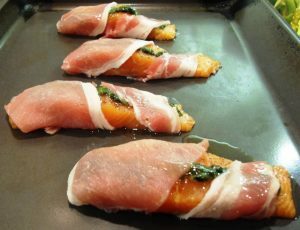 What a great recipe, love salmon and bacon will have to give this a go.